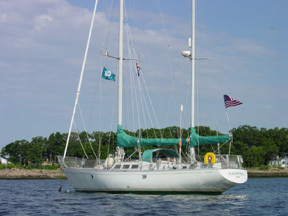 Chesapeake to LIS - Which Way Should We Go? When you are transiting the Delaware , you may decide to head up river rather than down the bay for a delightful visit to the “city of brotherly love”. It’s one of my favorite metropolitan places, being a large city with a small town attitude. Philly is a nice place to visit by boat. Yet as big a city as Philly is, there are few marina choices. 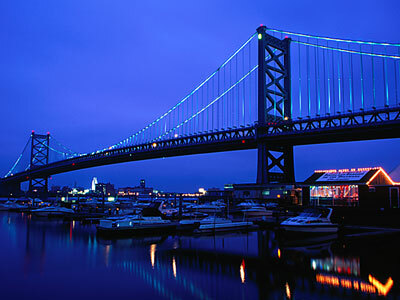 They are all generally clustered around Penn's Landing and/or the Ben Franklin Bridge . And none of them provides even close to the accommodations of the better marinas on the Bay. The good news is, that is a great neighborhood (I used to live there and our cousins live right on the waterfront), and the sightseeing/ restauranting/ barhopping/ history/ peoplewatching is outstanding! City Hall at the end of the Ben Franklin Parkway. One of the prettiest cities around. Philadelphia Marine Center might be the marina of choice, but it can be loud at times (Dave & Busters and Rock Lobster, two loud bars on-site). Plenty of transient slips and centrally located. Another choice is Piers Marina at Penn’s Landing, which is a smaller, family owned place that offers a BoatUS discount. They have a nice Italian restaurant on-site (La Veranda) and it’s a shorter walk to the main Philly attractions. The tide at the marina has a 3-5' range. There are two dock areas there, Piers 3 & 5. Be careful as it can be quite shallow. The accommodations were are no frills - the bathroom consisted of the toilet, sink, shower and washer dryer all in one room. It isn't very crowded during the week and the rate is quite reasonable. Good things to see while you are in Philadelphia include Independence Hall (take the tour  they do a great re-enactment of the signing of the Declaration of Independence), the Constitution Center, Liberty Bell, Betsy Ross House, Philadelphia Museum of Art (awesome location with the steps where “Rocky” trained), The Franklin Institute (fabulous children’s science exhibits), and on the other side of the river the Camden Aquarium. You could also see a Phillies game, go shopping on Market and Chestnut Streets, and sample the many very good restaurants and pubs in center city, especially on Walnut Street . The last time we were there, we had dinner in a terrific seafood restaurant and then did a pub crawl from Center City towards Liberty Landing. What fun. Have a great time!